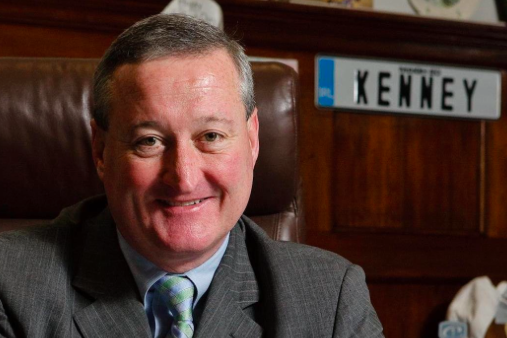 Longtime City Councilman Jim Kenney resigned Thursday morning, a necessary move in his bid to become the city's next mayor. Kenney, a 23-year veteran, took part in his final City Council session, delivering a goodbye speech and receiving accolades from his fellow Council members. Kenney — who is expected to formally declare his mayoral candidacy next week — became emotional as he spoke, praising Mayor Michael Nutter, Council President Darrell Clarke and his colleagues, according to tweets from reporters at City Hall. He also highlighted the effect of his marijuana decriminalization bill and celebrated his work with the LGBTQ community. "I just love you, and I'll miss you," says @JimFKenney, fighting back tears as he closes his last address to city council. Kenney announced his intention to resign on Tuesday, essentially declaring his mayoral candidacy in a press conference with reporters. The city charter requires city officials to resign before running for another position. Kenney will join a race that includes three announced candidates: State Sen. Anthony Williams, former District Attorney Lynne Abraham and former City Solicitor Nelson Diaz. Former State Sen. Milton Street and Doug Oliver, a former Nutter press secretary, also are expected to run. Though he has not formally declared, Kenney already has received the support of at least one labor group. The National Union of Hospital Health Care Employees District 1199C has endorsed him, according to PoliticsPA.com. Union President Henry Nicholas released a statement lauding Kenney as a "lifelong advocate for Philadelphia's working families."